Gloomy Eeyore gets the pop-art treatment from world-renowned artist Romero Britto! Bursting with bright, bold colors, the usually pessimistic old donkey makes friends with a glitter-dusted butterfly. 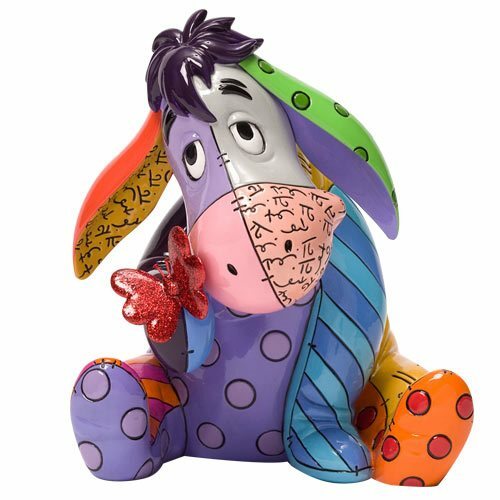 Carefully capturing the celebrated artist's signature details and look, but with an added colorful flourish, this one-of-a-kind Disney Winnie the Pooh Eeyore Statue by Romero Britto is a wonderful way to take home this world-favorite character. He measures about 6 2/5-inches tall and boasts accurate detail that's sure to delight any Disney fan.